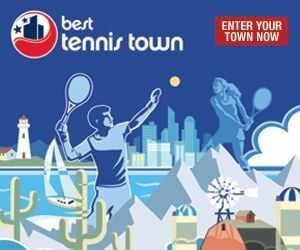 Nominate your town for a chance to win $100,000 and the title of 2010 Best Tennis Town! The winning town will receive $100,000 to be used for tennis programming or facility enhancements community wide and will be crowned the Best Tennis Town at the US Open. *No purchase necessary. VOID WHERE PROHIBITED. Eligibility: Nominees must be municipalities within the 50 U.S. and D.C. (each a "Community"). Communities must be nominated by a mayor or other executive official or a leader of a local sports commission or community tennis association within the Community (each a "Nominator"). Contest begins on 4/7/10 at 12:01 PM (ET) and ends on 6/28/10 at 11:59 AM (ET) ("Contest Period"). Best Tennis Town contest sponsored by The United States Tennis Association Incorporated, 70 West Red Oak Lane, White Plains, NY 10604. See terms and conditions, and official contest rules, at	www.besttennistown.com for complete details. The United States Tennis Association Incorporated © 2010.